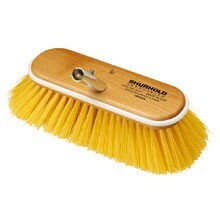 Shurhold's medium yellow polystyrene brush is designed for ground in dirt, canvas and non slip areas. 07041 10 inch (25cm) Medium Yellow Brush (985) Shurhold brushes feature a hard wooden base, premium quality bristles, rust proof nickel-silver stapling wire and a wrap around safety bumper. Shurhold s exclusive SHUR-LOCK quick release system locks any Shurhold handle quickly and easily with all Shurhold accessories.